These are Happy times in Baraboo. 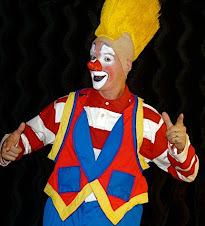 Jimmy Williams, better known as Happy the Clown, is the latest winner of the Gem Award. “His iconic image still brings a smile to generations of faces,” Mayor Mike Palm said in reading a proclamation in Williams’ honor during Tuesday’s City Council meeting. Each month, Palm gives the Gem Award to someone who has helped the community prosper. 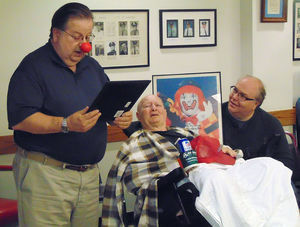 This time, he donned a red clown nose before handing a plaque to Williams, who is wheelchair-bound due to ill health and was escorted to the meeting by fellow clown Greg DeSanto. “His legacy in clowning and circuses continues to influence future generations of aspiring clowns, and it is fitting that the community he gave so much to recognizes his contributions,” said DeSanto, executive director of the International Clown Hall of Fame and Museum in Baraboo. Williams arrived in Baraboo in 1962 at the urging of then-Circus World Museum boss Chappie Fox. 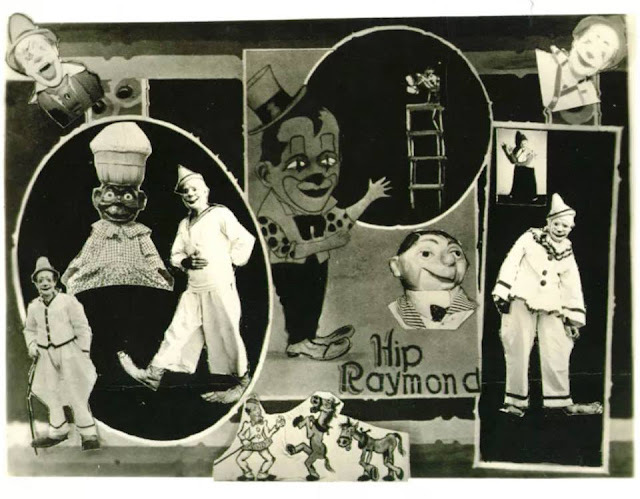 At Circus World, Williams developed his Happy the Clown character, who entertained audiences for 35 years. Happy was an ambassador for the museum and the city, appearing in parades across the Midwest. 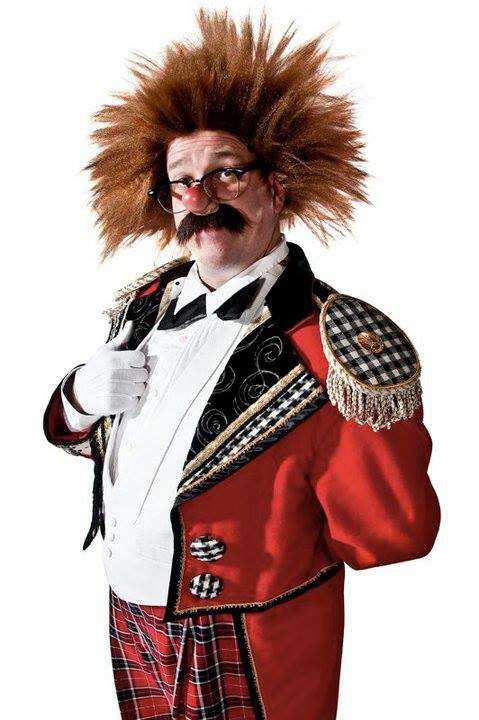 He created a clown club that helped launch the careers of many clowns, including Jed Crouse of Baraboo. 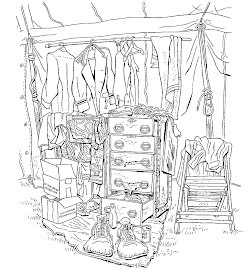 “Happy’s generosity in sharing his wisdom as well as his props with me has set me up for opportunities to grow into the performer I am,” Crouse said. 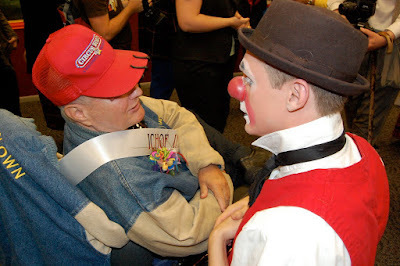 Longtime Circus World clown and ICHOF inductee Jimmy Williams with current Circus World clown Neil Skoy at the Grand Opening of the International Clown Hall of Fame in Baraboo, WI. Crouse said Happy was well-known in the clowning community, and was a generous and detail-oriented teacher. Whenever Happy taught Crouse a trick, he’d insist upon it being demonstrated immediately to passersby. “Hap was always willing to share a trick, but wanted to make sure I always understood what he meant and could perform it correctly,” Crouse said. Williams also served on the staff of a clown camp at the University of Wisconsin-La Crosse, and routinely appeared at Wisconsin Dells attractions such as Storybook Gardens. DeSanto noted Williams is one of three Hall of Fame inductees from Wisconsin, and Happy the Clown’s display is one of the museum’s most popular exhibits. “He has entertained generations of Baraboo citizens and thousands of guests in our community,” DeSanto said.